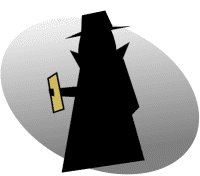 I read the latest article from Anthony Watts at WUWT. 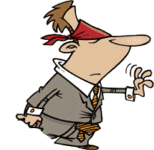 It reminded me that he really is dumb as an ox and blind as a bat. Now you and I know that temperatures have been going only one way - up. And it's been getting really hot these past few years. Last year was the third year in a row that was the hottest on record. This year is shaping up as possibly the second hottest. So what does Anthony Watts do? He plunges deep into idiocy with a most ridiculous article today (archived here). 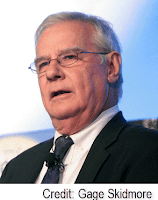 Judith Curry has posted an article by Patrick J. Michaels from the Cato Institute (archived here). 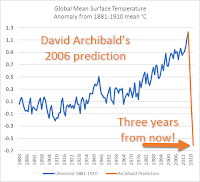 He is wearing his conspiratorial tendencies on his sleeve, and wants Donald Trump to prevent the publication of a report mandated by the US 1990 Global Change Research Act, the Fourth National Climate Assessment (NCA4). 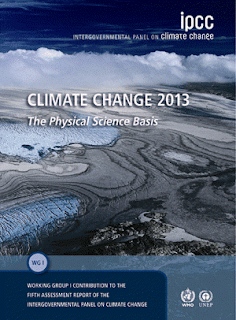 The chapter headings of the new report are listed here. The Assessment Report will be produced by civil servants in the federal government (mainly unfireable GS15’s reporting to Obama Administration bosses), many of whom handle large amounts of climate research money. It has always been in their interest to portray global warming as alarming, and therefore in need of even more federal research dollars. I call this projection. 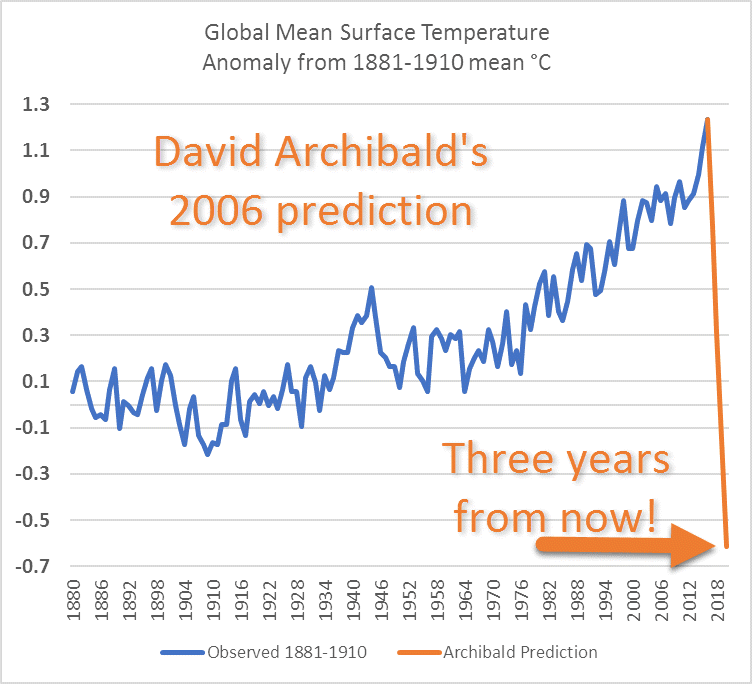 Would Pat Michaels retain his own job for the Cato Institute if he started to write about climate science in an objective, factual manner? It seems to me he managed to get a job with them because he was a science disinformer. Some of articles at WUWT are indistinguishable from gibberish. 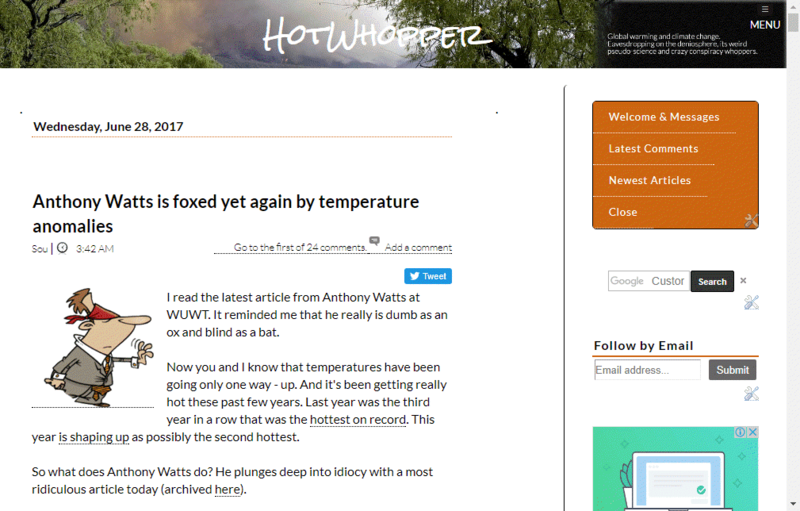 In the past few months, Anthony Watts has taken to publishing articles by a very strange man. He now calls himself Leo Goldstein. When he first wrote articles for WUWT, he wrote as Ari Halperin. He's the chap who came up with the Google conspiracy, and developed a tool to combat it, made by Google :D.
That's fine. Thing is, I don't understand what Leo's difficulty is. Anthony Watts has joined the sky dragon slayers he used to ban from his blog at WUWT. Well, he used to ban some of them. 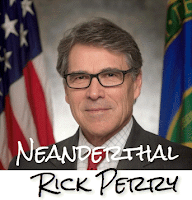 He's joined forces with Rick "Neanderthal" Perry, the US Secretary of Energy, who rejects climate science outright. The sky dragon slayers are among the dumbest of the dim deniers, who don't believe the science of climate change. Most of them have spent their retirement years trying in vain to disprove the greenhouse effect. Sky dragon slayers reject the notion that carbon dioxide is a greenhouse gas and is causing global warming. They think our planet stays warm by magic, or from the warm breath of their god, or from pixie dust, or something. A heads up for everyone who was saving up their pennies to join Anthony Watts' secretive Open Atmospheric Society. Between the 25 Apr 2017 04:13:51 UTC and 26 Apr 2017 13:21:40 UTC, Anthony Watts quietly removed his plug for people to join the quiescent, dormant, or dead Open Atmospheric Society from the sidebar of his WUWT blog. Was this action prompted by the end of the US tax reporting year? Was Anthony feeling a rare pang of conscience about taking money from his fans and not delivering the goods? Or was the disappearance an oversight, a temporary glitch, with the advert about to make a reappearance? If you are still hoping to join that fake sceptic society, the OAS website is still there, though there is no sign of a board or journal or anything else. In fact, nothing has been added to the website for almost two years. You can read more about the secretive open society with the help of Google - this is the timeline. According to GISS NASA, the average global surface temperature anomaly for May was 0.88 °C, which is 0.05 °C less than the hottest May in 2016, making May 2017 the second hottest May in the record. Here is a chart of the average of 12 months to May each year. The 12 months to May 2017 averaged 0.91 °C above the 1951-1980 mean, which was 0.10 °C cooler than the 12 months to May 2016. 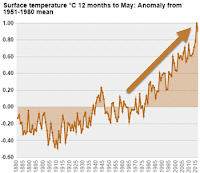 This makes it the second hottest May to May 12 month period on record. Lots of HotWhoppery hugs to all the climate scientists around the world from Antarctica to the Arctic, in Australia and surrounds, Africa, America north and south, Asia, Europe or running a hopeful experiment on Planet B. 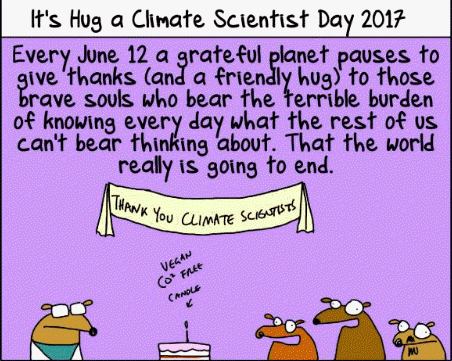 First Dog on the Moon sent a reminder that It's Hug a Climate Scientist Day. Just remember: no surprise hugs! See the full huggy greeting cartoon here at The Guardian. Many of you will have been glued to the internet (or television) over the past few hours, first watching the Comey session before the Senate Committee in the USA, then the elections in Britain. While you were being entertained, an important report was released here in Australia. It's known as the Finkel Review, because the panel preparing it was headed by Australia's Chief Scientist, Dr Alan Finkel. 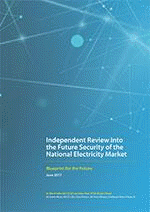 The report is called the Independent Review into the Future Security of the National Electricity Market. It has important implications for how Australia manages the transition away from fossil fuels (particularly coal) into the new energy economy. Some people are being pragmatic about it, others are concerned that it will mean that Australia will not move quickly enough, and that we won't meet our international obligations. Below is an article about the report, just published at The Conversation. Australia's Bureau of Meteorology is a wonderful organisation, highly valued by almost everyone who lives here. In the last year or so, BoM has been promoting a series of videos under the heading of #Ask BoM. The one below is all about weather radar (h/t @windjunky). Did you know that Australia has the fourth largest weather radar network in the world? It's the service I use most of all together with their weather forecasting service. I've even used it during bushfire season, because the radar can sometime pick up smoke. I just noticed an article at WUWT by Eric "eugenics" Worrall (archived here). This is someone who for years likened climate scientists to eugenicists. He's a bit upset at Jeffrey D. Sachs, who wrote a strongly worded piece denouncing Trump for pulling out of the Paris agreement. Eric, who is a Brit now living in Australia, was quite irate and keen to show off his double standards. President Donald Trump’s withdrawal of the United States from the Paris climate agreement is not just dangerous for the world; it is also sociopathic. Without remorse, Trump is willfully inflicting harm on others. There's a new paper out in Nature Communications this week, in which the authors explore the factors affecting the extreme heat in south east Asia last year. In mainland south east Asia, April 2016 was the warmest April on record, by a long way. 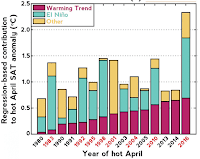 It was 0.9 °C hotter than the previous hottest April (1998). In April 2016, southeast Asia experienced surface air temperatures (SATs) that surpassed national records, exacerbated energy consumption, disrupted agriculture and caused severe human discomfort. It seems a worthwhile research project, particularly with global warming likely to cause more disruption and discomfort like this over time. On that assumption, Solar Cycle 25’s amplitude is likely to be two thirds of that of Solar Cycle 24, and thus 60. Further climatic cooling is therefore in store. What climatic cooling has there been? 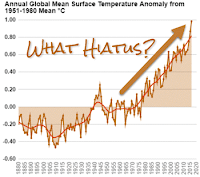 How can there be "further" climatic cooling in store, when there's not been any so far? 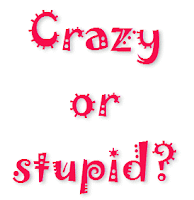 Inside the Matrix: Deniers @wattsupwiththat are still debating evolution! This will be short and weird. Today Anthony Watts posted an article at WUWT touting red pills and blue pills or red teams and blue teams or something (archived here). 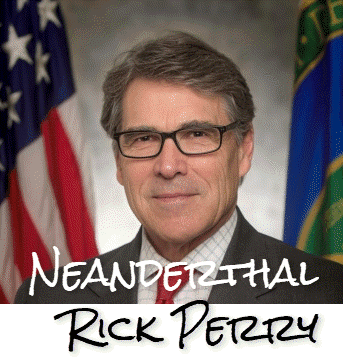 He's still waiting and hoping for someone from his "side" to disprove 200 years of science. Goodness knows, they've had enough time and opportunity to do so, but haven't because they can't. I mean, 200 years is long enough, surely, for someone to prove that we have physics, chemistry, biology and geology all wrong. That our technology can't possible work because it's based on fake science. 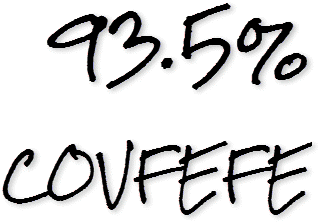 Over at WUWT, eight of the nine most recent articles are celebrating Trump's decision to abdicate his responsibilities to people in the USA (see here). As you'll have heard, he has declared his intention to isolate the USA even further than he has already. In particular, at WUWT they are celebrating Trump declaring that he refuses to fulfil US obligations to mitigate global warming. 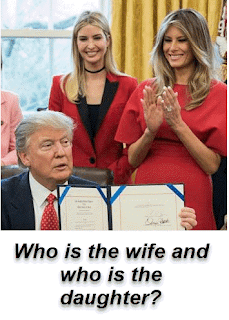 Let America and the world go jump, is the cry at WUWT. We live for the moment. If tomorrow we drown, starve or burn, at least we'll have shown those libtards what we think of them. 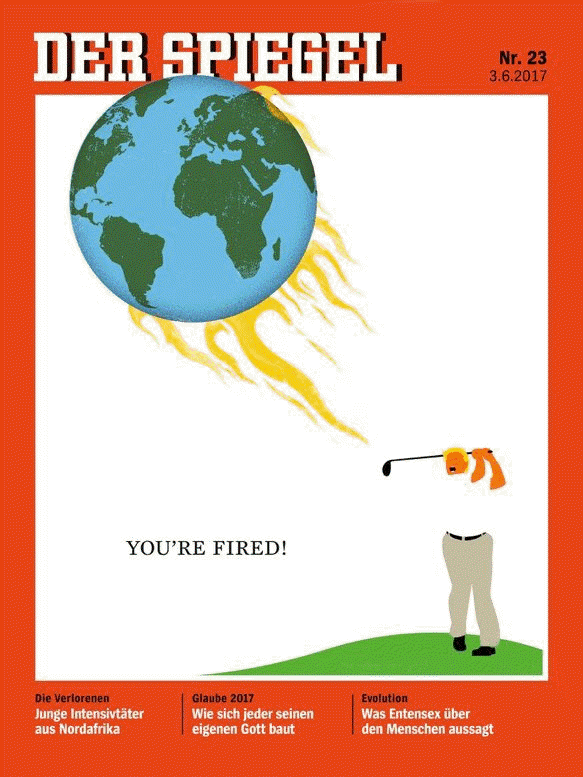 We don't give a damn about people in far flung places, or the fact that the USA is responsible for more global warming to date than any other country on Earth. The troposphere temperatures for May 2017 are out. This report covers the lower troposphere as recorded in UAH v6 and RSS TTT for the troposphere (without the "lower"). It follows pretty much the same format as previous monthly updates. 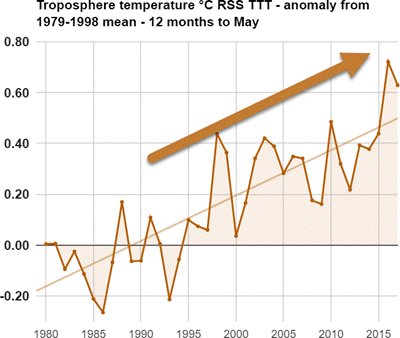 For RSS TTT (troposphere), the 12 months to May 2017 is the second the hottest 12 months in the record (comparing similar June-May periods). 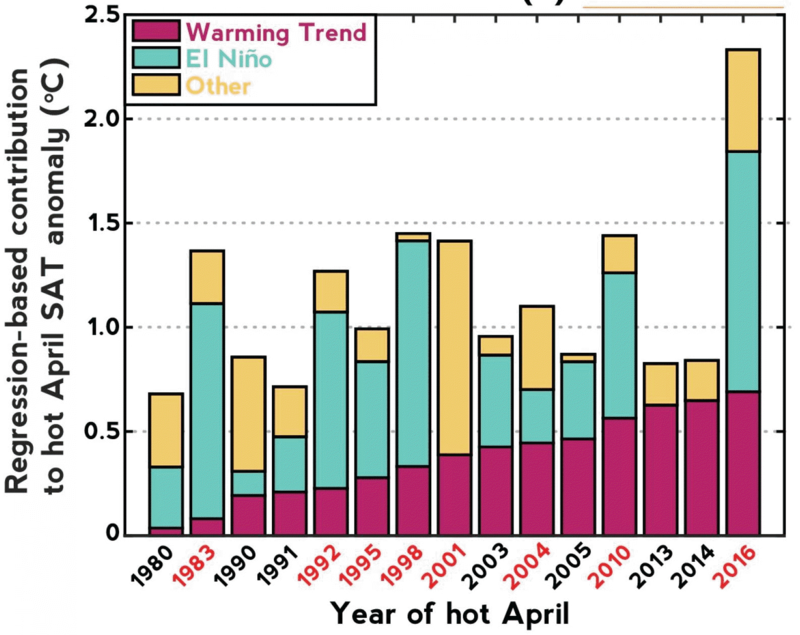 Now that last year's intense El Nino has dissipated, May itself was the just the fourth hottest May, with May 2016 the hottest. 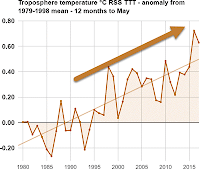 The lower troposphere (UAH v6) also showed the 12 months to May as the second hottest on record. 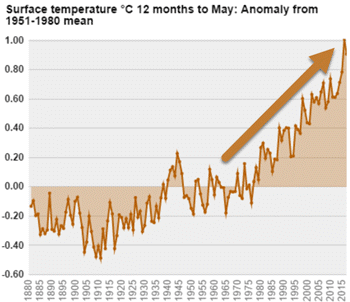 However, in the UAH record, May was the third hottest May on record, after May 1998 and May 2016. Since WUWT is read by both sides of the issue, I thought I’d run a poll to ask, so here goes.